7:00pm - The Country Music Hayride Show at the Esquire Theater downtown Carthage, featuring local bands Dusty Boots and Southern Impact.. Admission $6. Tickets sold at Chamber office and the Hall of Fame prior to the show, and at the door. 8:00am - 4:00pm - Texas Country Music Hall of Fame Gift Shop & Museum open; FREE MUSEUM TOURS! 6:00pm - Doors open for the John Ritter Tribute Showcase at the Carthage Civic Center. Tickets - $20 and are available at the door. Come vote for your favorite performer. Seats are not reserved. 7:00pm - Texas Country Music Hall of Fame John Ritter Tribute Showcase hosted by 2009 TCMHOF Inductee Linda Davis - 24 contestants vie for chance to represent the Hall of Fame as the Texas Country Music Hall of Fame Ambassador for 2020. Special guest performers include Holly Tucker, Billy Joe and the 2018 Winner Melissa Evans. 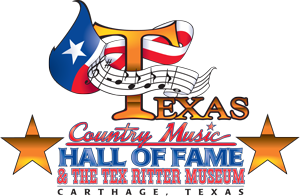 8:00am - Texas Country Music Hall of Fame Gift Shop & Museum open (FREE TOURS); KGAS Radio "Tex Ritter Round-Up" with book signing featuring guest authors, live music by the Southern Impact Band, free museum tours, special guests, autographs. KGAS is sponsoring the County Music Showdown, a music competition with a top prize of $1000. Contact KGAS Radio for more info, 903.693.7176, online at www.easttexastoday.com, or on the day of the event at the TCMHOF. 6:00pm - 22nd Annual TCMHOF Induction Ceremony and Show with Emcee Dallas Wayne, the Texas Country Music Hall of Fame Band, Tony Booth, Amber Digby and special guests TCMHOF Inductees THE GATLIN BROTHERS! Inducteees for 2019 are Jeannie C. Riley, Rodney Crowell and Claude Gray. 8:00am - Texas Country Music Hall of Fame Gift Shop & Museum open - Come by and tell us Goodbye! 9:00-10:30am - Gospel at the Hall with special guests to be announced. No charge - everyone welcome!